Hello readers. 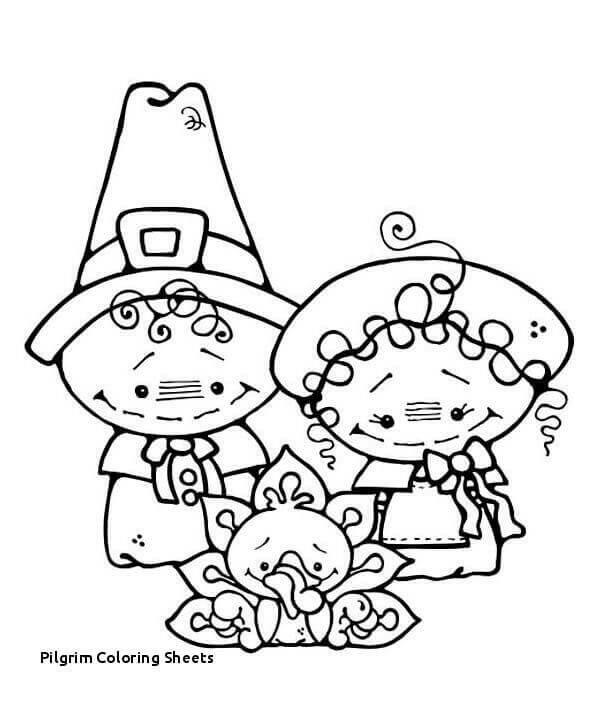 Today we’ve got you free printable Thanksgiving Pilgrims coloring pages. Thanksgiving is an important day in the United States which has its root in the history of the United States. This is an annual celebration and is popularly known as Thanksgiving Day. The first celebration of the Thanksgiving took place in the year 1621. This was celebrated in the month of October by the Pilgrims in the New World to mark the first harvest of autumn. 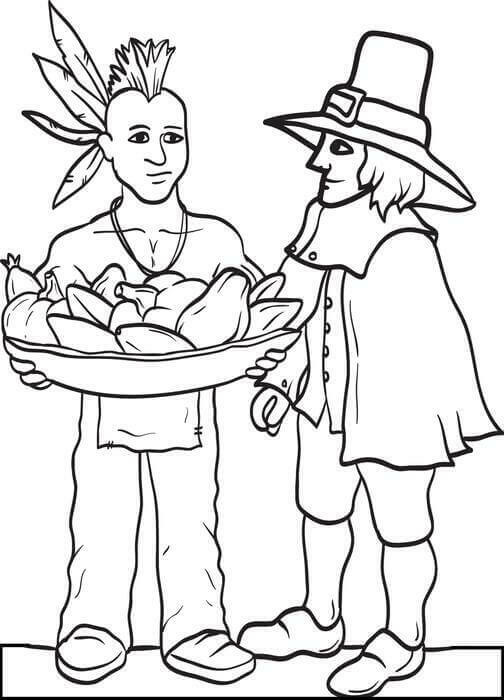 Pilgrims were actually a group of people who founded the Plymouth Colony. This group of people was religious in nature and they would often feel the discrimination by the Archbishop. This congregation kept on moving farther from England seeking their freedom to worship. In order to found their freedom, they had to travel to different parts of Netherland and finally got the permission to settle down in the New World. This journey to the new world was full of disturbances but their will to win made it possible. 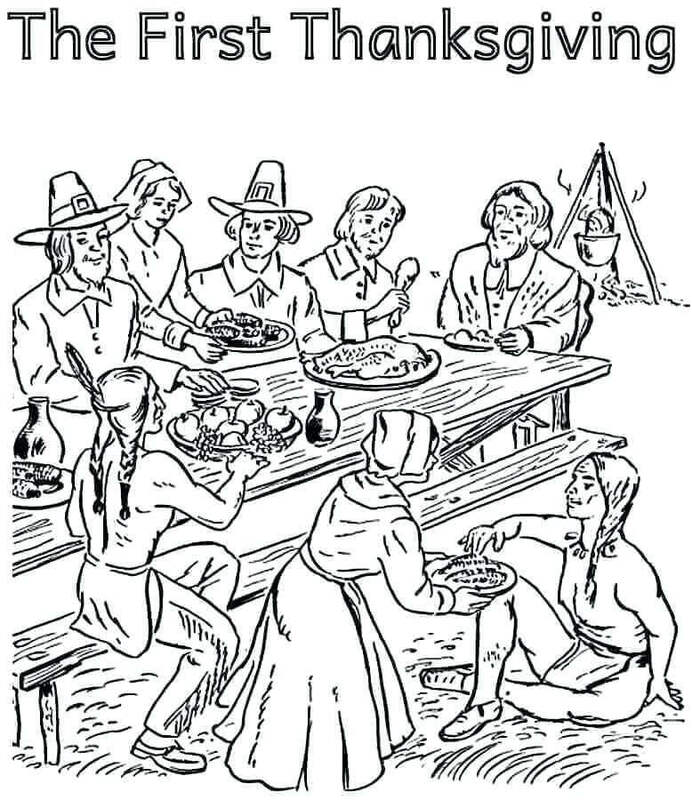 The first Thanksgiving was celebrated by giving thanks to the Native Americans who helped the Pilgrims to survive their first year in the Plymouth colony. The annual celebration of Thanksgiving Day is an informative and effective way to teach children about the American history. 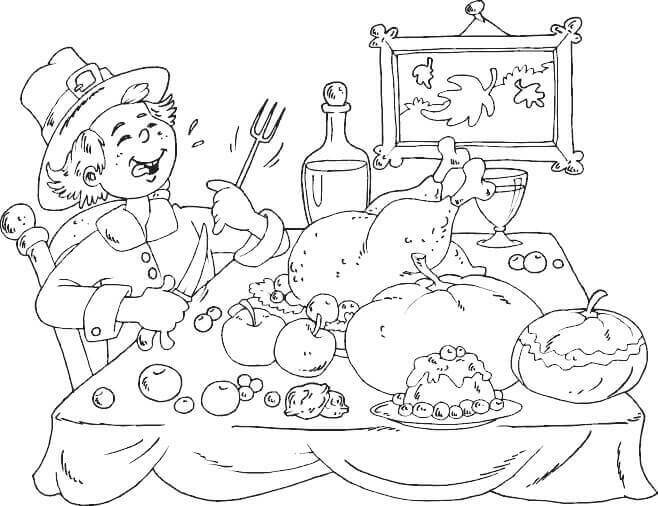 Now let’s check out our free Thanksgiving pilgrims coloring sheets to print. The pilgrims had differences in religious belief with respect to the Church of England. But they were not allowed to practice their belief in their own ways and had to leave England. They faced hardship in their expedition of freedom to worship. 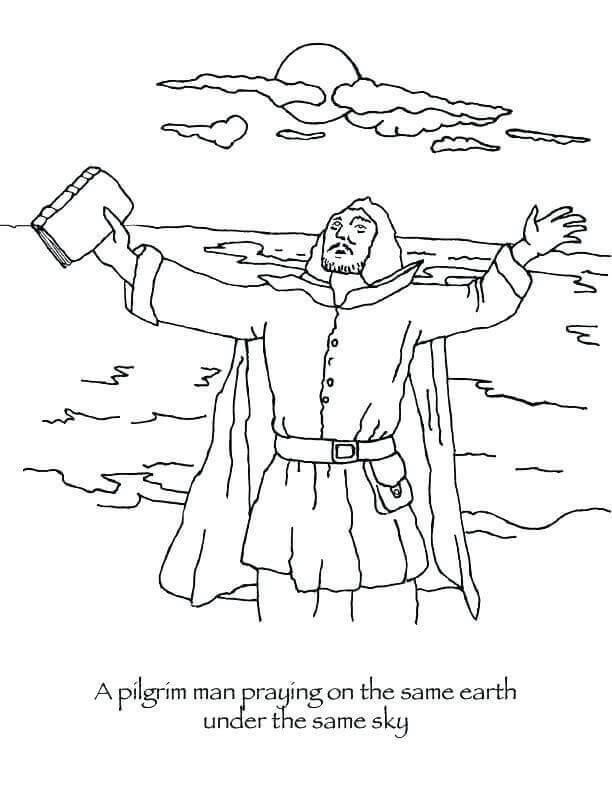 This image clearly depicts that the pilgrim man is praying to God to grant him success in their struggle for freedom to worship their religion on the same earth under the same sky like that of the English church. Fill the man and the surroundings with color in a way like God is showering his blessings on him. The little munchkins with a pumpkin in between are making the most of the day. They have promised to change the basket of fruits and vegetables with chocolates and cakes next year. Just see if you are able to identify the contents of their basket. If yes color them right. 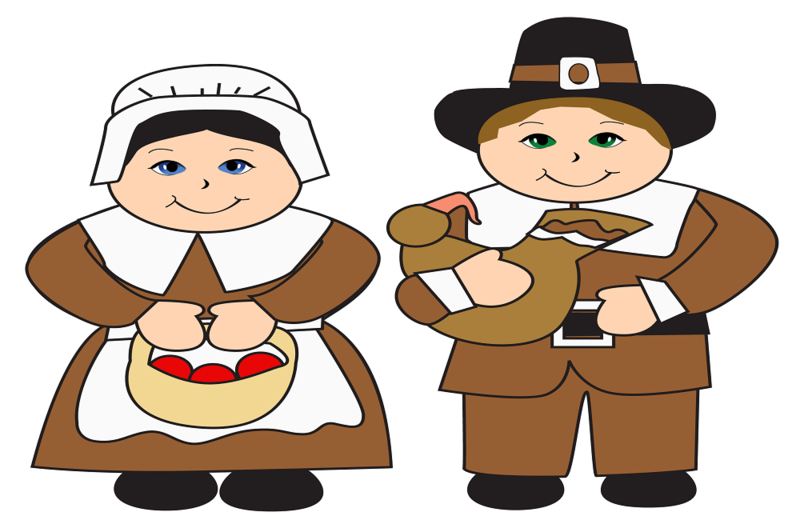 Do you know Thanksgiving was originally celebrated by the Native Americans and the English Colonists or the Pilgrims? After a year of hard work, the harvest season has arrived and the pilgrims are getting ready to collect the products. Once they fill their big basket they will present it to the Native American standing at right, as a token of thanksgiving for strengthening their bond. The ship called Mayflower carried a group of the Pilgrims and headed to Plymouth. However, the Mayflower was anchored at the Provincetown harbor and only sixteen men along with their captain sailed in a shallow draft boat to set foot in the New World. The motive of the men was to secure a land to settle down with the entire group. Lot of courage, strength, and hope are needed to set foot in an unknown land. What do you think? Were they welcomed by the native people or they had to carry on their search for a land? Look for the answers while you color the image. Turkey is a favorite dish served during the celebrations of Thanksgiving Day. 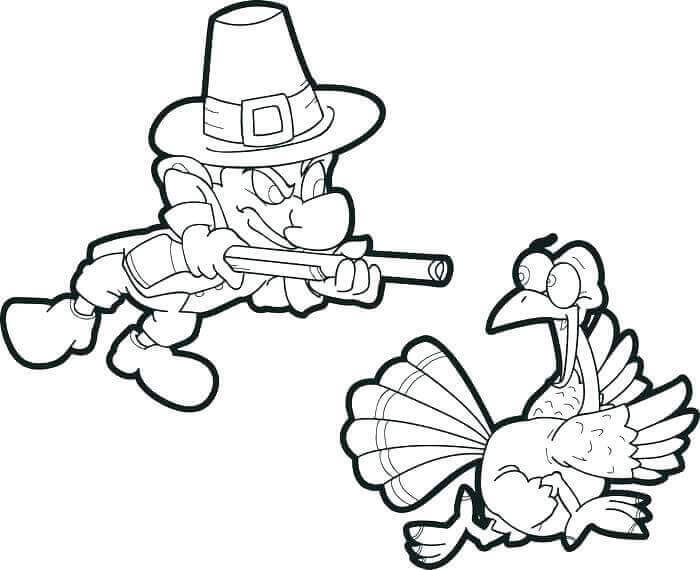 This man is holding a gun on the poor turkey because she has stuffed herself with the pumpkin pie stacked by the man for celebrations. Now the man is left with nothing but Turkey. Now the turkey is going to be stuffed and roasted to make a scrumptious meal for the celebration. What color have you decided on the ‘Turkey in Shock’? 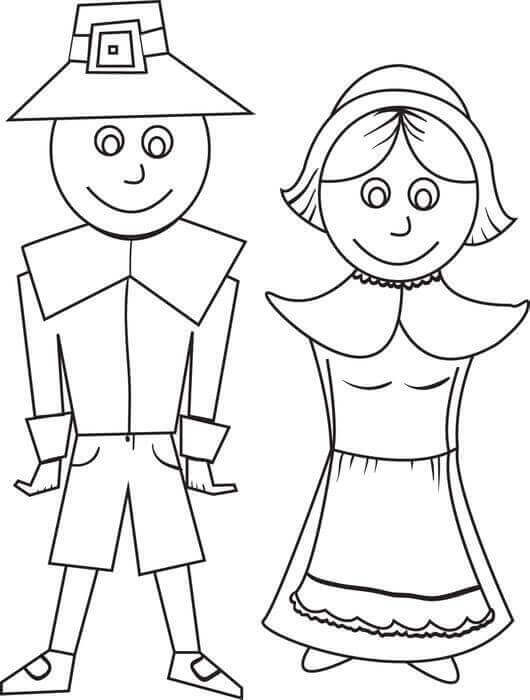 Do you know kids what is Mayflower and what is its significance? Mayflower is the name of a ship and its importance lies in its journey. The ship carried the congregation to the New World. The ship not only carried a group of people but also carried their hope of landing safely to place where they would be free to practice their religious beliefs. 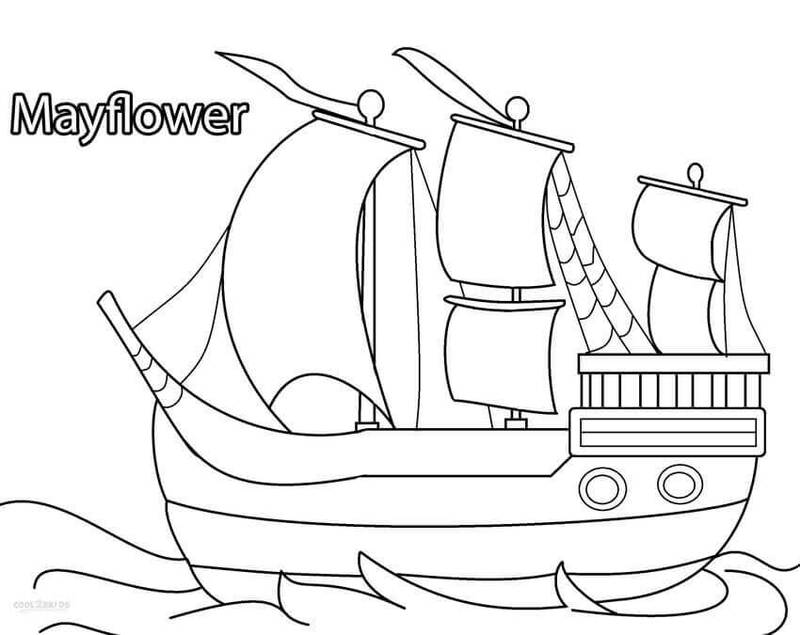 Let’s see how beautifully you can color the different parts of the Mayflower. The image is satisfying as it makes us believes that the pilgrims are welcomed and accepted by the native Indians on their lands. The little girl has come to meet her native Indian friend. She has made sure that the plate is full with all the fruits and veggies harvested in this season. There is no emptiness in the plate like their friendship. Do you know the exact color of each fruit? They fear no one but God. The trio has made up their mind that come what may, their journey would not cease before reaching its destination. The days to come might be challenging but aren’t they looking ready to fight all odds. They are led by the youngest member who is born with a drive to excel. The family of three is ready for the Thanksgiving celebrations. The smile on their face that runs from the one end to the other end of their face indicates that the scrumptious meals are just in front of them. Let their appearance complements the colorful meal. The year 1621 holds significance in the history of America as this year started the trend of celebrating Thanksgiving Day. The pilgrims thanked God for granting them success in surviving the brutal winter and they also thanked the Native Americans for accepting them on their land. The celebration is generally marked with enjoying delicious meals with family and friend and a roasted and stuffed turkey is a symbolic item of the day. The image also depicts the same. 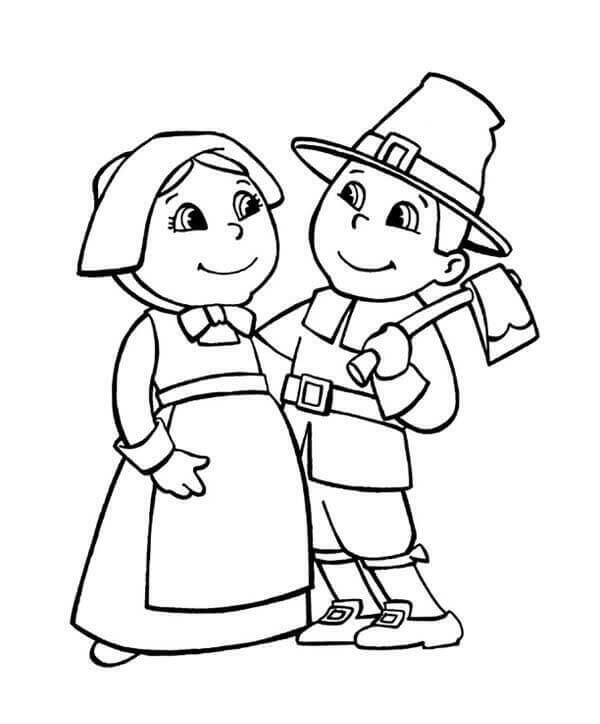 The emotions and familiarity shown in the image make the pilgrims and native look like a family. 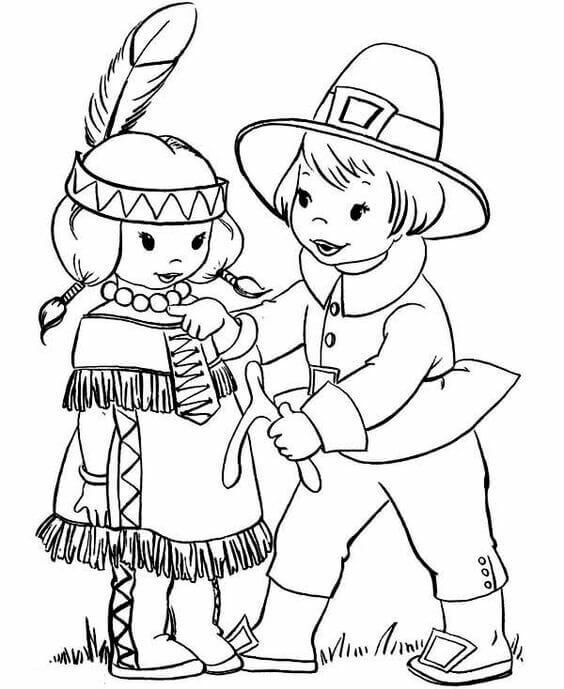 The little pilgrim girl is welcoming all her Native Americans friends with open hands. She might look empty hands but her broad smile assures that the basket full of harvest products are just hiding behind her. The image has many geometrical shapes. Let’s color them. 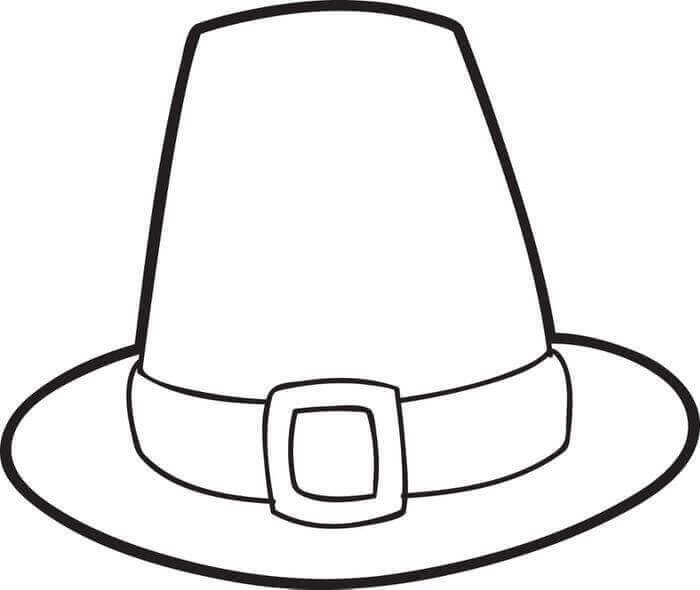 The celebrations will begin only when you wear this pilgrim hat. Don’t worry you will get the delicious food as usual. You are not finding them because they are hiding under the hat. Make sure you color the hat before wearing it. Let’s join our hands for a Kodak moment. This photo will remind the world that the Pilgrims and the Native Americans were friends and the native stood by the Pilgrims in their struggle. Make use of all the colors available with you to showcase their bond. 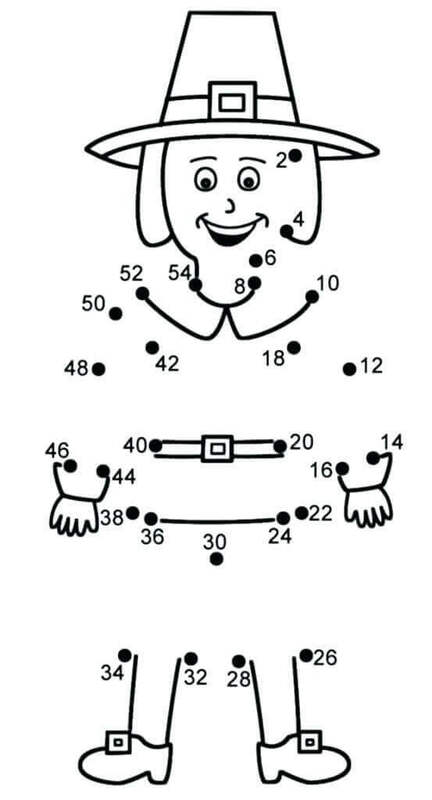 To find out the question all you have to do is to join the dots with a pencil. Though the image is incomplete his smile is complete. Do you know why so? Because he knows that you know the sequence of numbers and would color him also. What comes to your mind on seeing this image? The native and the pilgrim have come with their gift but how would they hand it over to the other? It looks someone has to put his item on the ground? Who would be that? Color and think. Lucky – Mom has asked me to hunt a turkey for Thanksgiving party. But I don’t have pebbles to slay it. Lucy- Don’t worry Lucky. You can use the beads of my necklace for the slingshot. Color the image beautifully to show their togetherness. The first slot of the Pilgrims headed by its leader met the native American Indians with a hope to find a place to settle down in their province. The Native American Indians were kind enough and the two got into a treaty for the successful establishment of the colony of the Pilgrims. When the early settlers reached the Plymouth they were welcomed by the Native Americans Indians with a tray full of fruits. 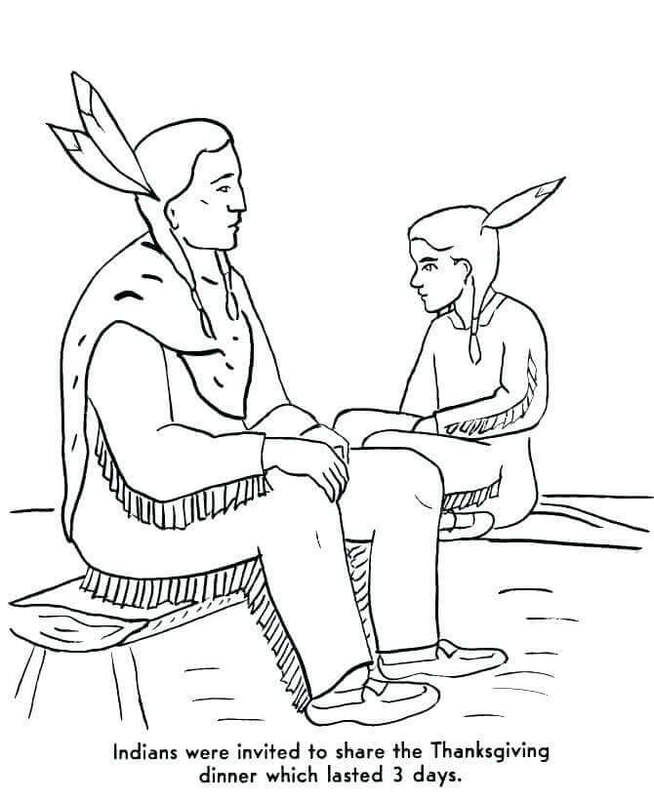 This gesture showed by the Native Americans was a great relief for the Pilgrims in their time of struggle. Identify the fruits and color them. After finding a place in the New World, the Pilgrims were free to follow their religious beliefs. This freedom worked as a guiding force and they started finding means to support their life. The land allotted to them was used for agricultural activities and equal participation of men and women were contributed. Your little kin has just started to learn drawing and now it is your turn to complete the image of happy Pilgrims. Don’t forget to add colors to the image. The Pilgrims received the land in the New World but they had to work very hard to give the land the shape of a beautiful colony. They put a lot of efforts in building their homes in the New World. The man is so happy to see that the naughty turkey can’t run away now as it is lying legs up. The man is ready to take a bite. It is time to enjoy different mouthwatering items served on the table. You can also enjoy by coloring the image. Of course, he can eat all the items served on the table. See how big he can open his mouth. Before he finishes everything, make sure you get your share. What color have you decided to give this naughty? It is a good practice to thank God for all the blessings, strength, success, etc. He has showered on us in our time of struggle. The pilgrims were no exception to this and they thanked God for a good harvest in their first endeavor. This practice was cultivated in their kids also and till date the ritual takes place. The image exhibits the same emotions of hope of the Pilgrims that they would get a place to settle down in the New World and they were welcomed in the New World. Never lose hope and have faith. His eyes are shining. How about giving his clothes a shiny look? The early settlers or the Pilgrims of the New World depended heavily on wildfowl for food. The area had good numbers of wildfowl and turkeys. All contributed to the first Thanksgiving feast and this family of the Pilgrims had hunted a fowl for the grand feast. The pumpkin is also ready to be served. The first Thanksgiving feast was celebrated in the form of a dinner and it lasted for 3 days. The participation of the Pilgrims and the Native American Indians were noticed in the feast. The native got invited because they had helped the Pilgrims in their struggle. After a good harvest, the Pilgrims decided to celebrate by thanking God. They had successfully survived the first brutal winter in the New World. This called for a celebration. The Pilgrims also invited Native Americans Indians for this feast for all their support. The native looks on while the Pilgrims read out the religious sermon in praise of God. It becomes very tough if we have no freedom to worship and have to face religious persecution. Same was the condition of the Pilgrims and they had to look for a place where they could find the freedom to worship as they please. From here the journey of the Pilgrims to the New World began. The first Thanksgiving was a mark of good harvest, success and a win over all the odds. The joy of the Pilgrims is worth watching and the equal participation of the Native Americans Indians in their celebrations is commendable. The annual celebration of the Thanksgiving Day is held on the fourth Thursday of every November in the United States. The day is a holiday to make sure that all the family members get together for a prayer meeting which is followed by a luscious dinner. This a wonderful occasion for all to thank God for what we have. He never ceases to shower his blessings upon us, likewise, we should always thank Him for granting our wishes. 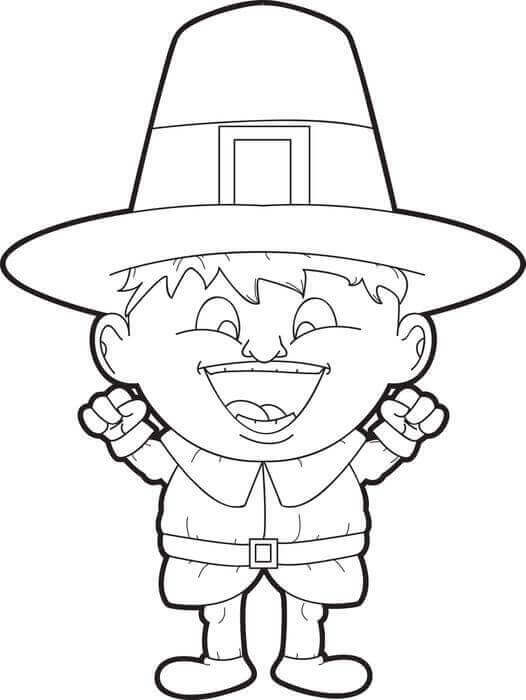 Let us know what you think about these Thanksgiving pilgrims coloring pictures to print by commenting below.